Fiduciaries are important people in the business and financial world. They are the people who, by the nature of their position, are required to be loyal, honest, and trustworthy because they have control over money, property, or person, for someone else. The word "fiduciary" comes from the Latin word fiducia, or "trust." So a fiduciary is someone in a position of trust. Fiduciary responsibility means acting in the other party's best interest, giving the assignment the highest level of care possible. In a fiduciary situation, there are two individuals: a trustee and a beneficiary. Some fiduciaries may take on the responsibility by being hired, and some may be court-appointed, as with trustees of estates, or as guardians or conservators. What are Different Types of Fiduciaries? A number of occupations and positions have fiduciary responsibilities. In each case, there is a document describing the relationship and responsibilities of the two parties. A will, an investment contract, or a board of directors policy manual might be a fiduciary agreement. In most cases, there is payment involved by the beneficiary to the trustee or fiduciary. Although a board of directors may not be paid, they still receive a (non-monetary) benefit from the relationship. 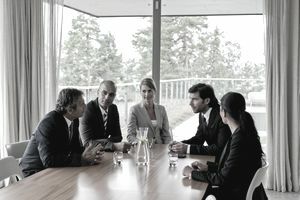 Typical fiduciary positions in business are members of the board of directors, financial executives, and those who are responsible for business investments. Members of a board of directors of a non-profit or NGO are fiduciaries. An executor or personal representative for an estate is a fiduciary. Attorneys and CPA's have fiduciary duties because they can influence someone to make a legal or financial decision. Brokers, bankers in trust departments, and investment advisors are also fiduciaries. A guardian or someone who has a power of attorney for another person is in a position of fiduciary responsibility to care for the other person. What are the Specific Duties of a Fiduciary? The fiduciary is in a position to control the money of the beneficiary, either as an advisor (an investment advisor, for example) or someone who has direct control, as in the executor named in someone's will. Giving Fiduciaries have what is called a "duty of care," to make sure that they are doing the best possible for the beneficiary. This might mean using their own expertise or hiring experts who can give expert advice. Make decisions that benefit the fiduciary at the expense of the beneficiary. This is considered a conflict of interest. For example, a fiduciary can make a contract with his or her business on behalf of the beneficiary, but not if the contract unduly benefits the board member or isn't the best financially for the business. Hire individuals who are incompetent or who are doing things that are illegal. The duty of care extends to making sure that hires are competent and trustworthy. What are the Fiduciary Responsibilities of a Board Member? A board of directors has a fiduciary responsibility in a general sense because they must make decisions that affect the corporation financially and legally. Board members can't avoid fiduciary responsibility by hiring an expert, because the board is ultimately responsible for its decisions. Yes, individual board members can be sued for breach of fiduciary responsibility. For example, a board member might have hired a vendor who had personal ties to the member. Board members have a general duty of care, but they also have more specific duties. The board must protect the corporation, including not doing anything that would harm the corporation. The board must also use their best skills to make the corporation profitable. While a loss of profit may be beyond the control of the board, they still must put profit at the top of their list of duties, balancing this duty with their other fiduciary duties. What If a Fiduciary Breaches Responsibilities? It's against the law for a fiduciary to breach his or her duties to the beneficiary. The legal part comes into play because the two parties have entered into a contract, as noted above. If the fiduciary is sued for failing to exercise their duties, a court might decide the fate of the fiduciary. The plaintiff may recover damages, including punitive damages. State law governs penalties for breaching fiduciary responsibilities. Texas law, for example, makes it a penalty to misapply fiduciary property (to use the property for purposes of personal gain or against the wishes of the beneficiary). What Should Be Included in a Work for Hire Agreement? What Does a Corporate Board of Directors Do? What Is an Assignment of Contract in a Business Agreement?